Unfriended bombastically bills itself as a “new genre of horror” in its trailer; although this is most certainly not the case, it is an interesting and innovative take on an old genre. Based on a never-seen-before premise, the events of the movie take place in real time on one character’s screen, as a group of friends Skype with one another. While audiences may be wary of going to watch an 82-minute screencast, Unfriended has enough thrills and chills to keep them on the edge of their seats. Teenage girl Laura Barns (Heather Sossaman) commits suicide after an embarrassing video of her intoxicated goes viral. On the anniversary of her death one year later, Laura’s so-called “friends” are speaking on Skype, when a digital intruder using her username hijacks the call. The friends are a motley crew of horror movie clichés, from hothead jock Adam (Will Peltz), airhead Jess (Renee Olstead), mean girl Val (Courtney Halverson), geek Ken (Jacob Wysocki) and good girl Blaire (Shelley Hennig). Secrets, of course, are revealed and the audience learns that none of the friends are blameless in Laura’s death. 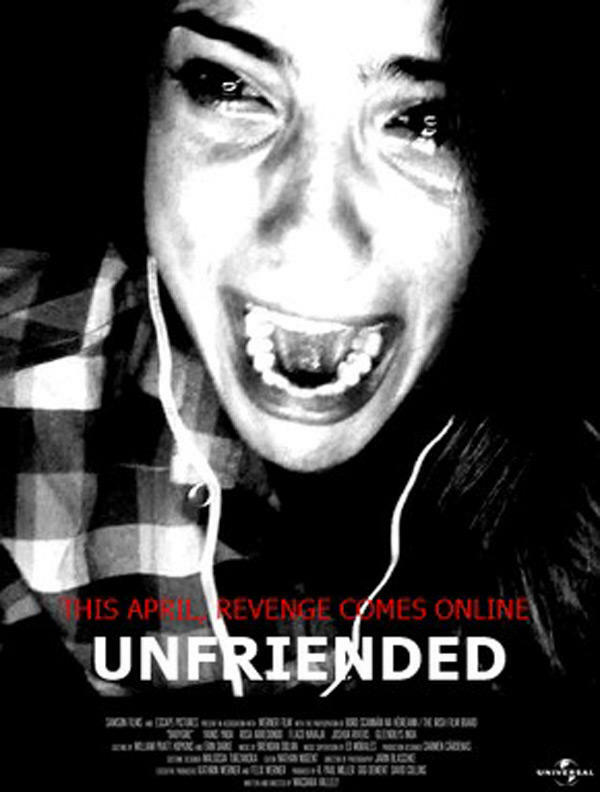 Or to put it another way, Unfriended is the I Know What You Did Last Summer of the digital age. The film adheres rigorously to its narrow premise, which is both its greatest strength and weakness. Because the entire movie is set on Blaire’s computer screen, Unfriended does suffer from being a tad static. On the other hand, this affords it clever ways of upping the tension, from thematically appropriate iTunes songs being forcibly played to text messages going unanswered. Hacking has never been so scary. The plot also has its fair share of issues, but the acting from the young leads is more than enough to gloss over these. All in all, Unfriended is a worthy effort that walks a narrow path, but perhaps does not push things as much as it could or should. Interest in the movie will no doubt be restricted to teens, members of the digital age that it so aptly portrays. However, among that generation, the movie sets the lore for what could be a successful and long-lasting horror franchise to come.